"My son would have turned three in January. Not a day goes by when I don't wish I could have saved him or traded places with him." 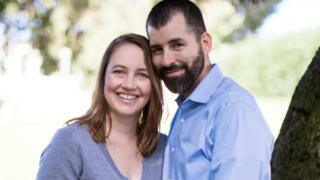 "The last couple of years have been incredibly challenging to say the least," says Jason, who lives with his wife in California. "Some folks tried to empathise, saying they'd been through the same thing or they know someone who has, bringing up their horrible story." "My wife's blood pressure was elevated and she was told to stay at home and come back the next day. But when we returned, Calvin had passed away. "It was horrible as we had to go to the same place where other expectant mothers were delivering their babies. "I got to hold him for a couple of hours. He just seemed like he was sleeping. I sang to him. "Then the nurses took him away and I had a complete breakdown." Nurses later gave the grieving couple a keepsake box of Calvin's baby clothes and photos of his hands and feet. "I opened the box and was completely overwhelmed with grief," says Jason. "The thought of him being in the morgue, a small defenceless boy, alone, was unbearable. "I broke down in tears, I was hysterical and I told my wife I had to go to be with him. I asked her to let me go because Calvin was alone and he needed his father. I intended to jump from the roof so I could join him in the morgue. "Susan called the nurses for help and they restrained me. "I was remanded to an observation room in the ER, stripped of my clothes, shoes and identification. They watched me for eight hours until a counsellor arrived to evaluate me. She diagnosed me with 'grief reaction' and let me go back to my wife. "Susan was very concerned about me. She could tell I was broken and she worried she was going to lose me too. The poor thing had just endured her third Caesarean section, lost her son and now she was consoling me, desperate to save me from myself. She said, 'I promise we will find joy again'. "I found that in the beginning stages of our grief many folks reached out and asked to help," recounts Jason. "It was difficult to answer those calls because of my raw emotional state. "I didn't even talk about it with my wife - but that was not her fault." "My friends and family who are on my network wouldn't approach me because they knew I was sad and they didn't know what to say to me and no-one wanted to upset me. "My boss at my old job told me to stop writing as it was, 'making people uncomfortable, because they have to watch what they say'. His words made me feel very uncomfortable, and I suddenly felt unsafe to share in such a public setting. "But interestingly Susan ended up reading what I wrote. She struggled with verbalising her emotions, and she said my posts were helpful. She would wait until her lunch break and sit in her car to read them as they were often difficult to get through without crying." "After a while, people moved on with their lives or a personal crisis would arise and their capacity for reaching out became limited," says Jason. "I understand. I don't mean to seem negative and I would like to think I have been a pretty good sport about the unending baby pictures on Facebook and the jabs about needing to, 'Cheer up!' and, 'Look more excited, we don't want your negativity'. The former are just people sharing their joy, the latter are pretty hurtful. "Everyone else has moved on so why can't I, right? It feels like a room in my house has been locked away and no-one asks about it. But I am mostly doing OK."
When Jason's wife became pregnant with baby Elliott in 2017 some of their friends and family thought this was the "happy ending to a sad story" but the pregnancy brought its own anxiety for the couple. "My poor wife woke up several times a night to feel the baby kick just to ensure he was still alive. Luckily, our baby Elliott is healthy and fantastic and keeps us on our toes. But he will never replace our fallen son. For Elliott and our other two children we work to find joy in life again. We owe it to them and we owe it to Calvin. "I am still very much grieving. I think about Calvin every day. His loss is a weight that I will carry every day for the rest of my life. "I have to balance being a father to my three living children who sometimes struggle to understand why Daddy randomly cries." Since Calvin's death, Jason has looked at life differently. "I used to work a lot - I was always busy doing long hours but after what happened I revaluated and focused on being more present. "Now I spend a lot of time with my kids and I have started doing things I would not have done before in case I got hurt, like climbing a tree! "Each time I accomplish something outside my comfort zone I dedicate it to Calvin. He will never get the chance to do anything so I feel I owe it to him to live life as much as possible. "I have gone white water rafting, started writing my own comic strip and begun riding a motorcycle! I talk to Calvin while I ride - perhaps it's the danger that makes me feel closer to him. Either way, I miss him and I look forward to seeing him again some day." Tommy's has information and support for parents on coping with grief after having a stillborn baby. Their free PregnancyLine is 0800 0147 800.